Both divisions of the Redmond Cup will come down to a showdown between the US and Canada at the Go Congress this year, with Jianing Gan 7d and David Lu 6d leading their age divisions, while Americans Andrew Lu 6d and Aaron Ye 5d placed second. 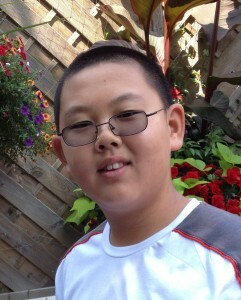 In the Jr. Division, 11 year old David Lu, from Vancouver is new on the scene, and proved to be a force to be reckoned with, scoring a perfect record in the online finals. Lu’s skillful play left last year’s Redmond Champ, Aaron Ye, and this year’s current US Youth Go Champion Jeremy Chiu 5d to duke it out for second. Ye prevailed and will face Lu in a best two-out-of-three final live at the Go Congress in Tacoma. For an exciting match between Lu and Ye in the qualifiers, check out Guo Juan 5P’s insightful commentary on the members only game record included with this weeks E-J. Ye gets off to an early lead, but Lu stays the course and makes a big comeback in the end. Youth members can join the AGA for only $10, and receive free commentary like this every week. In the Senior Division, defending champion Jianing Gan is intent on holding his title. His showdown last year, with Calvin Sun 7d, resulted in two consecutive losses for Sun. Gan also fought superbly in the Tygem AGA pro certification test at the same time, and came within a match of going pro. Gan again has a perfect record going into the finals, having already faced and defeated his two biggest rivals: Calvin Sun and Andrew Lu 6d. Lu is having a good year, having finally overcome his longtime rival Calvin Sun, to take this year’s US Youth Go Championship title, and now also finishing second in the Redmond qualifier. Lu will get his chance against Gan again at congress, with a live broadcast on KGS, at 3 pm PST on August 4th, 5th and 8th in the AGA Tournaments Room. The Jr. Division matches will also be broadcast. The Redmond Cup is now in its 20th year, and was directed by Michael Bull. Twenty-three players competed in the Senior Division (12-17) with another ten competing in the Junior (under 12). -Paul Barchilon, E-J Youth Editor. Photos: Upper Left, David Lu, by Jessie Fan; Lower Right Jianing Gan cementing his Redmond win at last year’s finals, by Paul Barchilon. Bruno Poltronieri 2d from Warwick University won the 25th Milton Keynes Tournament, beating Toby Manning 2d in the final round. Graham Blackmore 13k and Brent Cutts 8k also won all three of their games. Click here for full tournament report. The tourney was played on Saturday July 6, at the Sports Pavilion in the Open University‘s grounds. Milton Keynes is a planned city, built in the second half of the last century. Its location in Buckinghamshire was chosen for its equal proximity to the ancient university cities of Oxford and Cambridge and is itself the realspace centre of the (mainly virtual) Open University. It encompasses the town of Bletchley and hence Bletchley Park, site of the famous wartime code-breaking activities of Alan Turing and others. 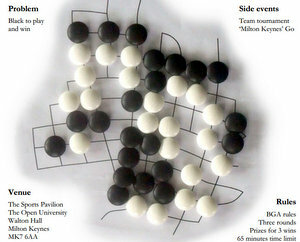 The roughly rectilinear gridwork road system is used as the basis for the board in the “Milton Keynes Board Tournament“, which is featured as a side event at the Milton Keynes tournament (graphic from tournament flyer at right; flyer and problem by Tim Hunt 2d, who also won the event. Solution to be published in the next edition of the British Go Journal). 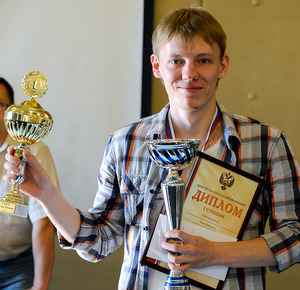 Dmitry Surin 6D came very close in his attempt to wrest the Russian Cup from favorite Ilya Shikshin on the final day of the 2013 Russian Go Congress on July 7. Surin, who unexpectedly won his game against Alexander Dinerchtein 3P in the semi-finals had defeated Shikshin in a recent tournament, so the match promised to be spectacular from the very start. As previously reported (Surin Bests Dinerchtein to Win Berth in Russian Cup Final 7/6/2013 EJ), Surin is an accomplished joseki expert and inventor, so it was no surprise when he started one of the myriad complicated variations of the taisha joseki. Both players stuck to their natural active fighting style, so the later part of the championship game delivered very intense collisions, an exciting clash lasting until the very end, with Shikshin eking out a narrow 1.5 point win. Poland: The 36 International Warsaw Go Tournament finished June 30 in Warszawa with Koichiro Habu 4d in first, Leszek Soldan 5d in second, and Stanislaw Frejlak 4d in third. Romania: After six long days, Cristian Pop 7d (left) was declared the winner of the Romanian National Championship in Mangalia on June 30. Cornel Burzo 6d placed second while Lucian Corlan 5d came in third. Netherlands: Zeno van Ditzhuijzen 5d triumphed at the Toernooi van Utrecht on June 23. Behind him was Robert Rehm 5d in second and Alexander Eerbeek 5d in third. I will be in Marquette from July 11 to July 29 and would enjoy a game or two. If you’re in the area, write me at roylaird@gmail.com. Dmitry Surin 6D (below) upset Alexander Dinerchtein 3P in the 2013 Russian Cup semi-final on July 6, knocking Dinerchtein out of his accustomed spot in the final, which will be broadcast on KGS on Sunday, July 7. 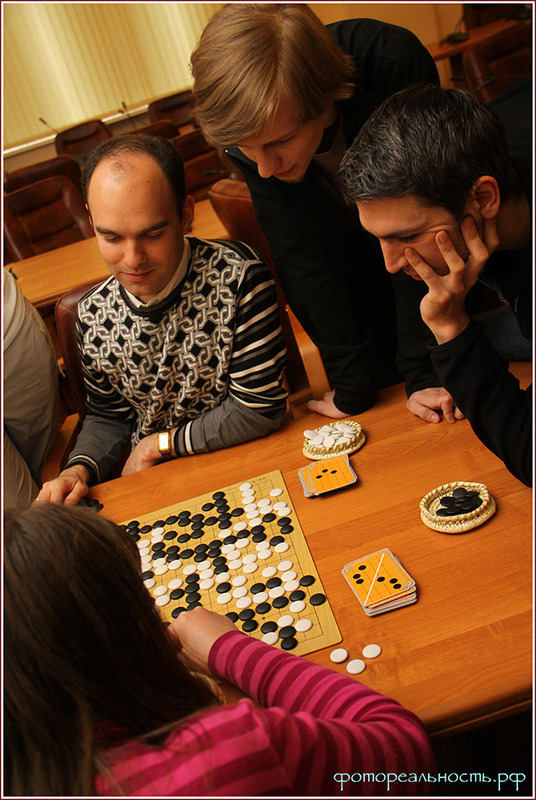 The Cup, which has about 70 players this year, is the final and most spectacular event at the annual Russian Go Congress. The battle of the A league includes the top right Russian players in a double-elimination tournament. Dinerchtein lost by 2.5 points to Surin, known in Europe for winning several European Pair Go Championships with partner Natalia Kovaleva. Surin’s style features deep knowledge and understanding of intricate josekis and difficult variations, great fighting skills and acute reading, all of which he brought to bear in his exciting game with Dinerchtein. Though Surin is considered to be one of the strongest Russian players, most deciding matches at major Russian events wind up Shikshin vs Dinerchtein clashes so Sunday’s final is being highly anticipated at the Congress in Saint Petersburg. Xinming Simon Guo sends us this brief clip of the go scene in the 2005 pilot of “Criminal Minds,” the CBS series starring Mandy Patinkin and Aaron Hotchner as agents in the FBI’s Behavioral Analysis Unit, which focuses on profiling the criminal, rather than the crime itself. 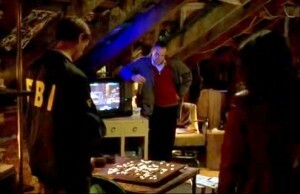 In this scene, the agents discover that their suspect is a go player and, saying that “go is considered to be a particularly psychologically revealing game,” analyze the board position in the suspect’s apartment to conclude that he’s an “extreme aggressor,” which is also the name of the episode. The European Go Federation has signed a far-reaching and lucrative contract with a group of Chinese investors to promote go in Europe. The deal aims to improve the strength of European amateurs, establish a professional system in Europe and support the European Go Federation, all to achieve the overall goals of enhancing go’s popularity in Europe, as well as developing new cultural contacts between Europe and China. “I think the AGA and EGF efforts will complement each other in a number of ways and give both organizations an even more forceful story to tell to potential sponsors,” said American Go Association President Andy Okun. “EGF President Martin Stiassny deserves a lot of credit for almost single-handedly bringing about this contract,” added Thomas Hsiang, the longtime International Go Federation and American Go Association official who was elected General Secretary of the International Mind Sports Association (IMSA) earlier this year. “I congratulate him on a job well done. There is a lot of hard work ahead, but with the efforts in Europe as well as in US, the future of go in the West looks bright and promising.” The investor group is known as the Beijing Zong Yi Yuan Cheng Culture Communication Co. Ltd. (called CEGO), and is comprised of investors who “believe on the future development of European Go and are willing to commit themselves to promote Go, a great representative of Chinese traditional culture, in the West,” according to the document. In addition to a “Go Academic System” that will send 4-6 players annually to study in China, the contract envisions a new professional go system in Europe in which the EGF will certify up to two players annually as “European Professionals” through new European top tournaments, including a yearly promotion tournament for the aspiring professionals. In addition to financial support for these initiatives, the contract pledges CEGO to contribute yearly payments to enable the EGF to become a “more professional organisation” – including setting up an office and hiring staff – in order to develop and implement these and other goals over the next decade. News of the contract, which was posted on the BGA website, originally broke on Lifein19x19, where there’s been extensive discussion of the deal. The first-ever official go-poker tournament is being held this week at the 16th annual Russian Go Congress in Saint Petersburg. 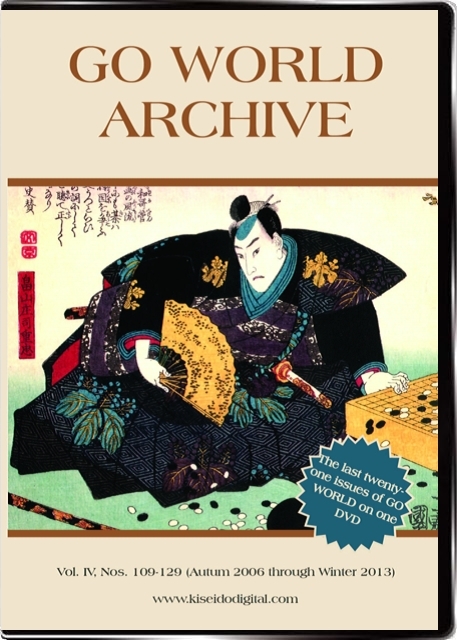 Also known as “Dango,” the go variant is well-known in Europe, where it’s played by top players like Matthew Macfadyen and Alexander Dinerchtein 3P. At the beginning of the game each player has 36 cards that can be either go shapes or “action cards” (placing or removing stones, pass etc). 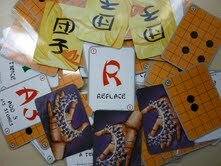 Opponents alternate turns, taking a card and “playing” it on the board. Unlike go, Dango introduces a significant measure of luck and randomness but proponents say “it is not on any account a foolish game,” noting that go-poker “requires memorizing, counting and tactical skills.” The entertainment factor for players and viewers lies in the unexpected twists that can turn the whole game upside down after each move. The go-poker tournament at the Russian Go Congress is being held in the evenings after the major regular competitions. Alexander Dinerchtein 3P, who’s a fan of Dango, is participating, providing amateurs with perhaps their best chance to best a professional go player.